More info:From £1345 excluding flights. Prices based on 2 adults sharing. Single supplement available. Mimimum age 14. On this trip we have a balance of time spent in the towns and cities and also out exploring the beautiful scenery on foot. We will take three countryside hikes during which our Tour Leader will explain about the local fauna and flora and also village life and customs, and about the importance of safeguarding these for future generations. We take the narrow gauge railway up through the huge expanses of beech and spruce forest in the Vaser Valley to Novat. We then walk on the forest trails up to a ridge to take in the views across the Viseu Valley before descending through hay meadows to Moisei. On our second walk we will take the chairlift from Borsa up the mountain for a ridge walk with wonderful views. Finally we will walk along old cart tracks to the rambling village of Putna and here we visit the Putna Monastery, which is the oldest in Moldavia, and inside is the tomb of Stephen the Great. We believe that it’s important to explore on foot and to use public transport like the railway and chairlift to get off the beaten track. Here we can then spend time and money in communities that only infrequently see tourists. We will also spend two nights exploring the Danube Delta, which is the best preserved and one of the largest in Europe. We will discover it on our pontoon – a barge style vessel resembling a large house boat – that will serve as both our transport and our floating accommodation. This provides an innovative and flexible way of seeing the abundant birdlife of the delta whilst making as little impact on the environment as possible. We will also take time to visit a village within the Delta. These are some of the most remote settlements in Europe, far away from any roads, so this is truly off the beaten track. Romania is truly a country where old meets new, and now is the time to visit, as since the end of communist rule the country has been constantly evolving and developing and so sadly in a few years’ time, the old way that we can still see today may have been lost. Here you can see large imposing buildings created to show the power of the country’s former communist dictator Nicolae Ceausescu and in contrast old wooden houses in rolling farmland, horse and carts going to collect water from thermal springs, and charcoal mounds at the roadside where the locals are still making this fuel in the same way as their ancestors have for centuries. 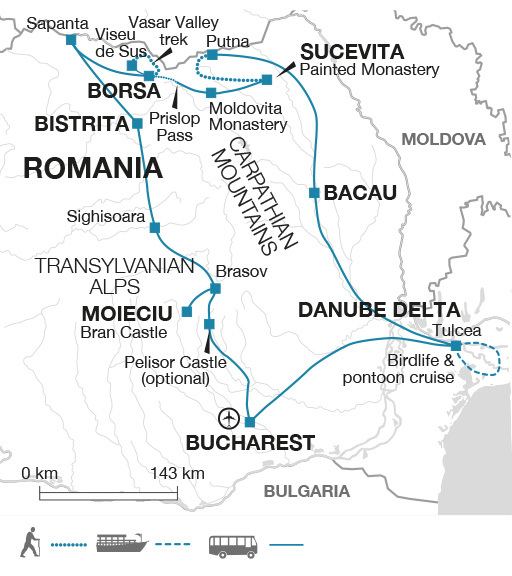 On this trip we’ll get to experience these untouched countryside vistas, elaborate castles, medieval towns, abundant birdlife and more of the wide variety of sights that Romania has to offer. We use a local Romanian Tour Leader and guides on this trip who know the country very well and who will help to give us a unique insight into its history, customs and culture and get us that bit closer to the local people. Our Tour Leaders are trained by us in the importance of responsible tourism with guidance given on how they can make a difference. As we travel around Romania we stay in a variety of local, family run hotels and guesthouses and eat out in small restaurants, which brings direct economic benefits to the communities we visit. A favourite stop of passengers on this trip is our family run guesthouse in Moieciu, which has homely feel to it and is decorated with traditional wooden furniture and textiles. Another great experience is our included lunch in a villager's home where we'll have an authentic and hearty meal. Romanian cuisine is delicious and often includes things such pearl barley or polenta, fresh root vegetables and cabbage, stewed beef or pork, sour cream and home baked bread.